Preheat oven to 350 degrees F (180 degrees). Mix together brown sugar, 1/2 cup butter or margarine, egg, buttermilk and 1 teaspoon of root beer extract. 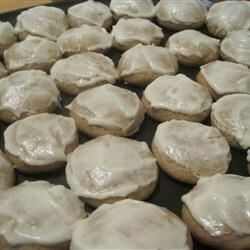 Drop teaspoon sized pieces of dough 2 inches apart on greased cookie sheets. Bake for 6 to 8 minutes. To Make Root Beer Glaze: Mix together confectioner's sugar, 1/3 cup butter or margarine, 1 1/2 teaspoons of root beer extract and hot water. Brush on top of hot cookies. These cookies are great!! I found if you make the glaze on the stove low heat it turns out allot better!